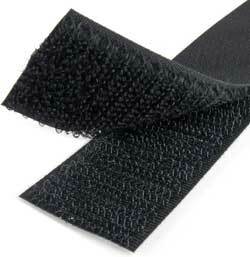 VELCRO® Brand Polyester hook and loop tape: This polyester hook resists moisture and ultraviolet light, making it perfect for use in outdoor applications. Hook #81- This hook has a medium cycle life when paired with polyester Loop 9000 and is available in widths up to four inches. Loop # 9000- Loop 9000 has a medium cycle life when paired with polyester Hook 81 and is available in widths up to four inches.